If you want to proceed to search out the matter regarding “The Law” then it is highly advised that you continue on with our investigation to uncover the scriptural facts. Does this mean that all the command­ments, statutes, and laws named in the Torah of Moses are no longer applicable? A dogma is “a public decree” which is also an “ordinance.” The dogma (decree) from Caesar for a census registration and his decree that there should be no other king save Caesar are two examples given in Scriptures (Luke 2:1; Acts 17:7). By comparing the Greek Septuagint (LXX) with the Hebrew Masoretic Text (MT), we also discover that the Hebrew/Aramaic word underlying the Greek term δόγμα (dogma) is דָּת (duth), “a royal edict or statute.” These decrees establish national customs and rituals. These examples reveal that a duth or dogma is the establishment of statute and custom by public decree, based upon present circumstances. They are often temporary, as reflected by the 30-day period in the above example. Paul further narrows his definition when he states that these annulled dogmasin (plural of dogma) were handwritten (Col. 2:14). The Abrahamic Covenants of Promise were a verbal agreement. There is no doubt that the dogmasin of which Paul speaks are only those decrees that were handwritten and placed in the book of Moses. 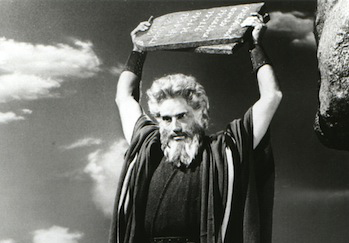 Nevertheless, as we shall see, just because we are now under grace and not under the Mosaic Law does not mean that the commandments or the entirety of the laws, statutes (i.e., those kept by Abraham), and dogmasin statutes (i.e., those established under Moses) found in the Torah are annulled. Customs are merely forms of actions practiced as a matter of course among the people. The customs established by the statutes and laws of Moses included such things as their type of dress, how to wear one’s beard, when things become clean or unclean, commanded sacrifices, and the like. The dogmasin nailed to the stake and annulled, as mentioned by Paul in his epistles to the Colossians and Ephesians (Eph. 2:11-17; Col. 2:13-15), include the idea of customs wherein “you may not handle, you may not taste, you may not touch, which things are all unto corruption in the using (Col. 2:20-23),” that is, they are works of the flesh. Josephus, a Jewish priest of the first century C.E., reports that “there happened to come around the festival called Passover, at which it is our ethos (custom) to offer numerous sacrifices to the deity (Jos. Ant. 14:2:2).” Therefore, the authority for offering sacrifices, such as the Passover sacrifice, comes as a legal custom. This fact alone proves that the sacrifices and burnt offerings later attached by means of the Torah of Moses were not a requirement under the Abrahamic Covenants of Promise (Torah of Trust), for which purpose the Israelites had been brought out of Egypt. Rather, it was due to the fact that the Israelites continued to sin that these sacrifices and burnt offerings were brought into force under the Torah of Moses or Old Covenant. These statements are all vital clues. They tell us that those things nailed to the stake at the messiah’s death were brought into existence by decrees which established certain ordinances or statutes, called laws and customs. These decrees were handwritten by Moses on a scroll, forming the Torah of Moses. Having blotted out the handwriting in the dogmasin, WHICH WAS ADVERSE TO US, also he has taken it out of the midst, having nailed it to the (torture-)stake (Col. 2:14). This statement is important because it carries with it the thought that there can also be dogmasin that are helpful to us. Indeed, Paul and the other apostles made the point that not all of the handwritten dogmasin in the Torah of Moses—which formed the augmenting statutes, laws, and customs—were annulled. To the contrary, among the decreed statutes given by Moses, there yet stand four types of dogmasin that still apply even to this day. Collectively, therefore, these four customs are dogmata (decrees), a form of the word dogmasin, which are found in Scriptures. If you keep these particular dogmasin “you will do well,” for they are advantageous for us. Yahushua plainly states, “If you love me, keep my commandments (John 14:15, 23).” These and numerous other statements from Scriptures prove that none of the royal commandments have been set aside even after the death of the messiah. Indeed, it does not make sense that Yahweh would still require the statute from the Torah of Moses ordering us not to eat blood but then would set aside the commandments that you shall not murder, steal, or commit adultery or negate the greater commands to love Yahweh and to love your neighbor as yourself. As a result, it is clear from this evidence that at least four groups of the dogmasin and none of the royal commandments found in the Torah of Moses have ever been annulled. In addition, we have not yet even touched upon the laws and statutes that were in existence prior to the Torah of Moses! At the same time, Paul pronounces that Yahushua the messiah is the only true offering and is our Passover victim (Heb. 10:1-18). Where remission of sins exists, “there is no more an offering for sin (Heb. 10:18).” Therefore, since the death of the messiah, there is no more need to sacrifice flock animals as a typology of the messiah’s death. Our true Passover has already been sacrificed. In summary, the details reveal that the popular notion about what the apostle Paul actually meant when he indicated that the dogmasin adverse to us have been annulled by the death of the messiah (i.e., the belief that all the commandments, laws, and statutes of the Torah have been nailed to the stake) is both misleading and incorrect. Rather, the evidence indicates that all must continue to observe the commandments and a number of the laws and statutes found in the Torah of Moses or Old Covenant while under grace. At the same time, there are many other statutes and laws which are no longer applicable. The premise is thereby established that, just because one sets aside the authority of the handwritten Torah of Moses (the Law), it does not mean that the conditions found in the Abrahamic Covenants of Promise (Torah of Trust) are also annulled. One must still obey Yahweh, keep his charge, and be subject to the same commandments, statutes, and laws observed by Abraham (Gen. 26:1-5). Adding to the complexity of Saul’s dialogue is the fact that, even though the Torah of Moses shall continue until heaven and earth pass away, we are not under the Torah of Moses but under grace. The truth of the matter is that when all of Paul’s teachings are properly understood, Paul is not that problematic after all. This entry was posted on 05/24/2012, 10:39 pm and is filed under Commandments, Grace, Messiah, New Testament, NT Patriarchs, Old Testament, Religion, Salvation, The Law, The Torah, Yahweh. You can follow any responses to this entry through RSS 2.0. You can leave a response, or trackback from your own site. Good to know Paul can be deciphered.